ICSSI is excited to announce the first annual event of the Kurdistan Social Forum, to take place in Erbil from 9-10 December 2017! The Kurdistan Social Forum (KSF) is a newly-founded space for coordination among CSOs and networks in the Kurdistan Region of Iraq, with a Secretariat based in Erbil and a committee of NGOs, trade unions and federations. The KSF was founded in September 2016 by Peace and Freedom Organization (PFO) following two years of preparation and dialogue with CSOs in the region. Prospects are very positive, since the founders of PFOK were among the initiators of the Iraqi Social Forum in Baghdad, and they want to build a parallel structure allowing CSOs in Kurdistan to mobilize with the same methodology and in coordination with the ISF. Having participated in World Social Forum events in previous years, Iraqi-Kurdish activists launched the KSF as a means to promote social justice movements in the Kurdistan Region of Iraq. It is an open space for movements, organizations and individuals who believe in principles of social justice and human rights in order to bridge political, civil, social, economic and cultural divisions. KSF activists seek to back civil movements in the Kurdistan Region of Iraq working towards political, economic and social reform in order to contribute to the development of an alternative future for the region. This annual event of the KSF will allow activists to create a visibile presence in Kurdish civil society and present themselves to activists across the Kurdistan Region. In this season an important role will be played by the five civil society working groups working on specific thematic issues coordinated within the KSF and operating under the project ‘Mesopotamian Youth for Democratic Governance, Social Cohesion and Reconciliation’, funded by the European Union. 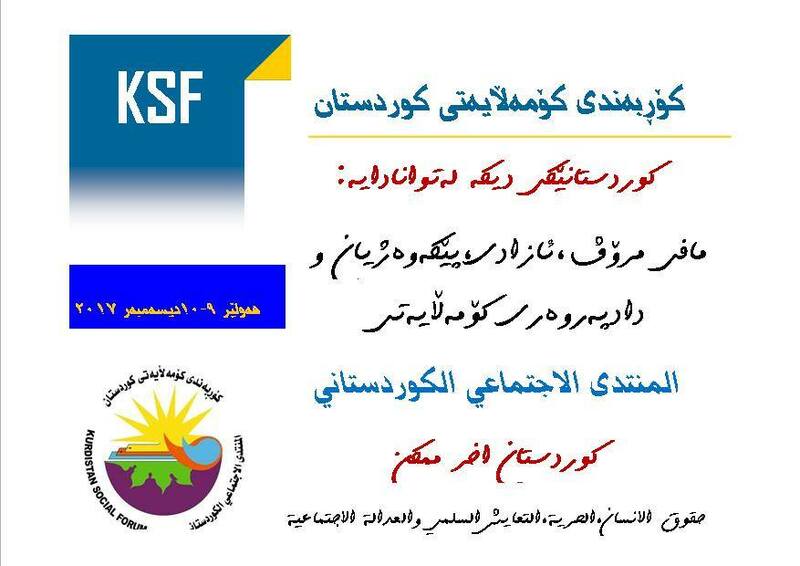 During the KSF, these working groups will host specific assemblies to discuss the following topics: the protection of IDPs and minorities, social justice and employment, media promoting tolerance and democracy, women’s participation in civil society and policy-making, water rights and the protection of Mesopotamia’s rivers. Hundreds of activists from civil society organizations within the Kurdistan Region of Iraq are expected to attend, as well as a delegation of the Iraqi Social Forum and an international delegation of ICSSI members to express their solidarity. 9:00 – 9:20 Opening of the festival, welcoming participants. 10:45 – 1:00 Distribution of working groups and per topic, discussion and brainstorming for 2018: what actions are needed, which priorities for next year? 3:30 – 4:00 Final evaluation of the KSF and plans for 2018. Previous postIraqis Fear Earthquakes, Terrorism Could Lead to Dam Catastrophe Next postKurdistan Social Forum Launched in the Kurdistan Region of Iraq!